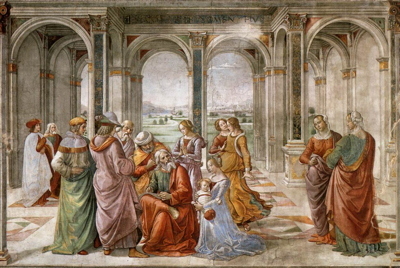 Domenico Ghirlandaio, Zacharias Writes Down the Name of His Son, fresco in the Cappella Tornabuoni, Santa Maria Novella, Florence, Italy. Zechariah’s song leads us through the second week of Advent in celebration and hope. But in this Scripture text, Zechariah’s song is almost as important as his months of silence leading up to it. During a time of oppression and sadness for the Israelites, God’s news of salvation wasn’t easy for Zechariah to believe right away. In the midst of suffering, it’s not always easy to embrace a message of hope. This week, on December 10, citizens around the world will recognize International Human Rights Day. The day honors the United Nations General Assembly’s approval of the International Bill of Human Rights—a compilation of documents which help lead the world’s nations in setting policies that uphold the inherent dignity of all human beings. The documents themselves identify the rights that every person in the world is entitled to by birth. Even though the Bill was adopted in 1948, it remains just as relevant to us today as it did then. Around the world, we are still struggling to provide relief and protection to those who live in fear for their basic human rights. Many are still fighting for the basic freedoms that underpin the Bill: freedom from fear, freedom of speech, freedom from want, and freedom of worship. Like Zechariah, we might have a hard time focusing on the hope and light that Jesus brings into our lives. Recent acts of religious and racial terrorism have brought fear, anger, and hopelessness to the forefront of our discussions and prayers. As Zechariah reminds us, Christ’s birth is a time for hope and faith. Despite years of suffering without hearing anything new from God (through prophets), Zechariah is able to embrace the coming of Christ through prophetic song. God’s promise of salvation is alive and well, no matter what we are going through. Zechariah’s song reminds us that God is always with us, giving us the freedom to hope. “The Universal Declaration of Human Rights,” United Nations, http://www.un.org/en/universal-declaration-human-rights/index.html. • What experiences or observations have made you doubt God’s gift of salvation? • In your community, who is living without one of these four basic human freedoms? How can you bring God’s message of salvation to them this season? • How does God give you hope, even in the midst of suffering? • How can you give someone hope through your words or actions this Advent? According to this poetic passage of celebration, Zechariah’s son, John the Baptist, will become the prophet who links the covenant of Abraham (gen 12) with the new Kingdom of salvation about to be initiated. According to Zechariah, John’s birth exemplifies the divine faithfulness that began with Abraham and continued through King David and the prophets. Even though of priestly descent, John will serve in the prophetic tradition to prepare the way for the Lord (Jesus) soon to appear in Israel. When seen in the context of both Luke’s larger narrative about the infant Jesus and his entire Gospel, Zechariah’s hymn of praise serves also to cast John in the role of a messenger of forgiveness, a theme emphasized by the Jesus of Luke’s Gospel. Any conflict thought to have existed between the followers of Jesus and the followers of John is smoothed over by Luke’s literary diplomacy. Whereas Jesus is the son of the Most High (1:32), John is the prophet of the Most High (1:76). Their message is the same: forgiveness. John will preach it, Jesus will bring it into being in his Kingdom. Joe E. Barnhart, “Benedictus,” Mercer Dictionary of the Bible, ed. Watson E. Mills et al. (Macon GA: Mercer University Press, 1990), 97. […] Zechariah’s song hopes for better days for these people, for fearlessness, enlightenment, and faithful service to God in the right paths. The priest’s song blesses God for redemption tailor-made for the crowd of neighbors and relatives who just left his house! Second, notice how his song anticipates John’s ministry. John will prepare the Lord’s way (3:4) will preach repentance for the forgiveness of sins (3:3) and will certainly bring the clarity of light to those who hear him preach. And when John mentions the promise to Abraham, it is to caution his listeners that Abrahamic descent is not enough (3:8). This helps to make sense of Zechariah’s mention of Abraham: the covenant promise is to rescue “us” so that “we “ can serve him in holiness and righteousness and without fear. Richard B. Vinson, Luke, Smyth & Helwys Bible Commentary (Macon GA: Smyth & Helwys, 2008), 46. Michelle Meredith is a graduate of Mercer University, where she was the editor for literary and arts magazine The Dulcimer. She taught third and fourth grade in Mississippi for two years with Teach for America and became even more obsessed with live music and southern food (don’t even get her started on Delta tamales). She loves comedy, board games, roller derby, and hanging out with her dog. She is happy to be back in Macon, Georgia as the associate editor of Formations.